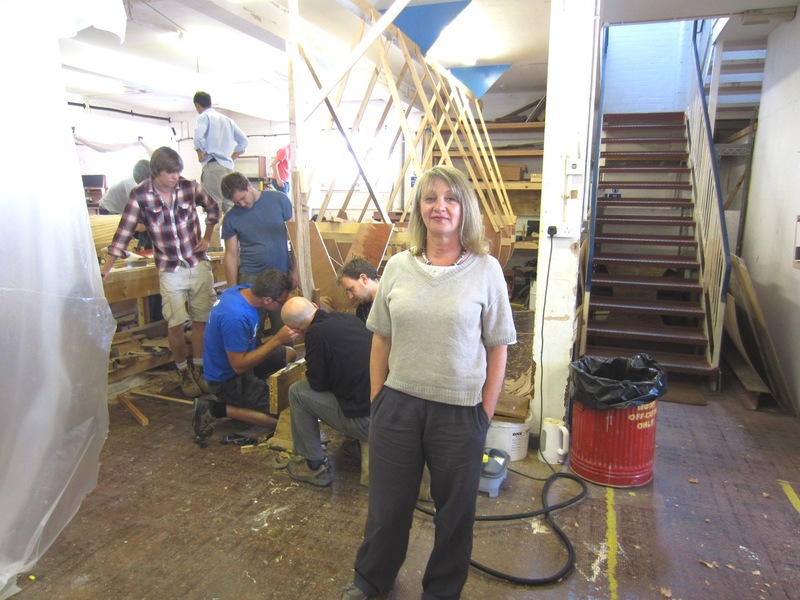 Boat Building Academy principal Yvonne Green has enlisted the help of local MP Oliver Letwin and MEP Sir Graham Watson in her campaign to persuade the UK Border Agency to make it easier for small independent colleges to accept overseas students. Both Mr Letwin and Sir Graham have approached the Home Office and UKBA on behalf of the Academy. Following a tightening of immigration rules, the BBA is being forced to turn away fee-paying non-EU students because it does not meet criteria that would allow it to sponsor foreign students to enter the UK. The non-profit-making Academy says it is losing significant income as a result – and students who would prefer to learn boat building skills in the UK are having to go abroad, including to the USA, which is normally considered to have very strict immigration rules. Other small colleges teaching non-degree level courses across the UK are likely to be affected in a similar way. The problem is that because it offers a Level 3 qualification (roughly equivalent to A levels) and not a degree-level qualification the UKBA’s rules do not allow the BBA to be responsible for sponsoring foreign students while studying the Academy’s courses in the UK. In particular, the standard 6-month visitor’s visa is not long enough to allow students to complete the Academy’s 38-week course — and college principal Yvonne is adamant that the course could not be squeezed into six months for the sake of foreign visitors. ‘The courses are intense as they are. We regularly have people working late in order to make the most of the facilities and teaching, and in order to complete the course to the standard that has made our reputation,’ she told intheboatshed.net. The BBA is accredited and regularly inspected by the City & Guilds, but this is not accepted by the UKBA as evidence of the Academy’s bona fides. 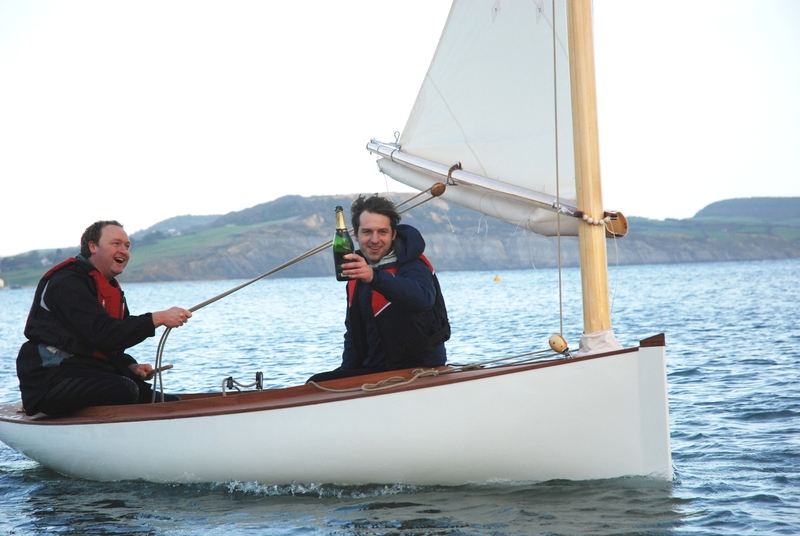 Meanwhile, just a few weeks ago Sir Graham commented: ‘Lyme Regis Boat Building Academy is an institution Dorset and the UK should be proud of. The academy delivers world class teaching in a skilled discipline and sells the UK as a top destination for education in this field. Despite wet weather, a crowd of friends, family, BBA staff, past graduates and even the Lyme’s Mayor joined the 18 students on the Academy’s 38-week course to celebrate completing nine months of hard work. Sunrise, above, was the first student boat to hit the water. 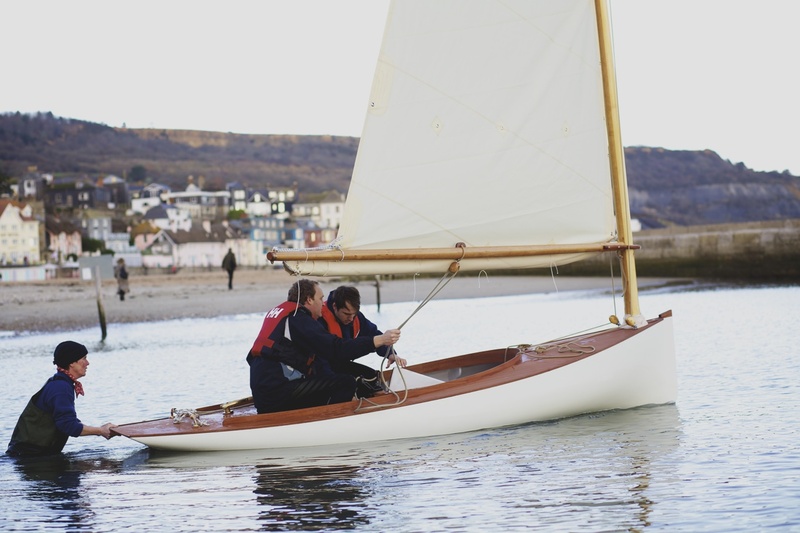 A 13ft by 5ft 6in traditional clinker-built dinghy planked in larch, she was built by students George Herivel and Will Heward, and will be used for rowing and sailing. Academy instructor Justin Adkin designed Sunrise using photographs of a boat that George’s family owned in Alderney, and then created a half-model of the boat to ensure that he was happy with the design. 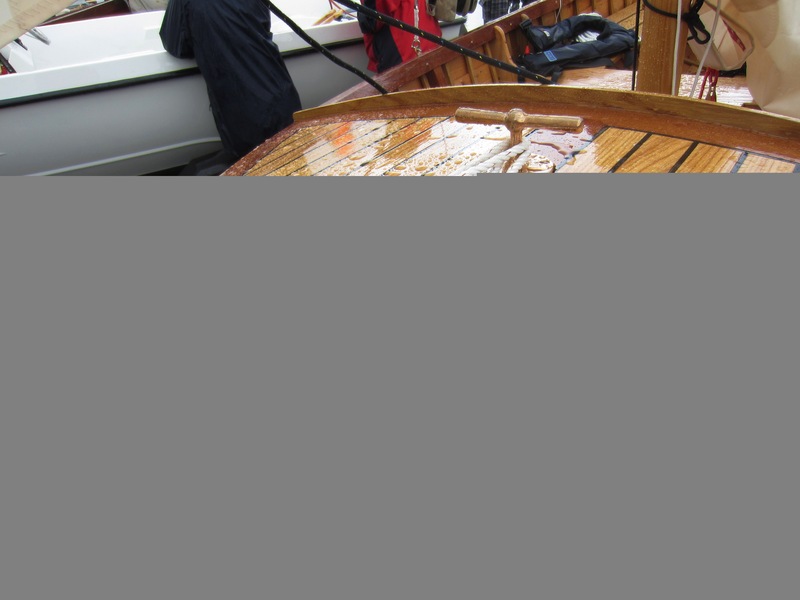 Justin suggests that some future students may wish to build the same boat, as it has good freeboard, a full transom and firm bilges – between them, these features should give the boat a secure feel, lots of bouyancy and the ability to stand up to its sails. 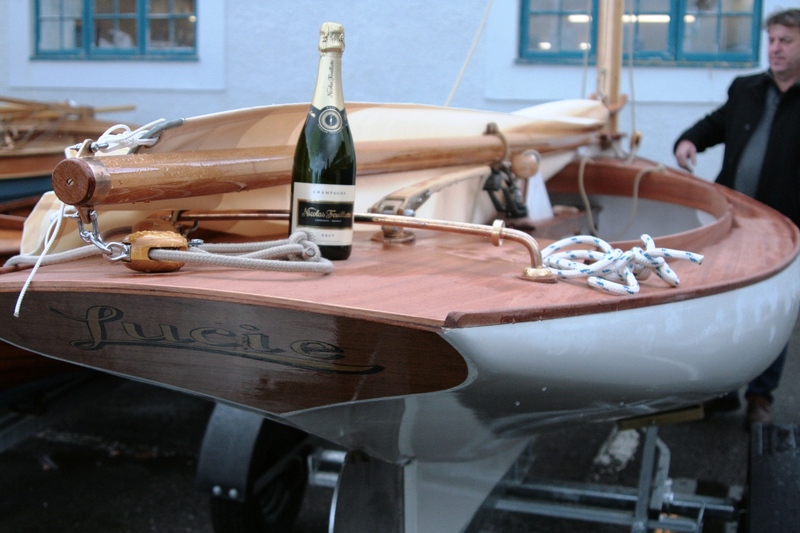 Goerge says he wanted to build a boat with the same stability and handling in fairly heavy weather as the original and has been completely happy with the outcome – the boat was sailing on Lake Windermere only last week, and although the breezes were light it still performed and handled extremely well. 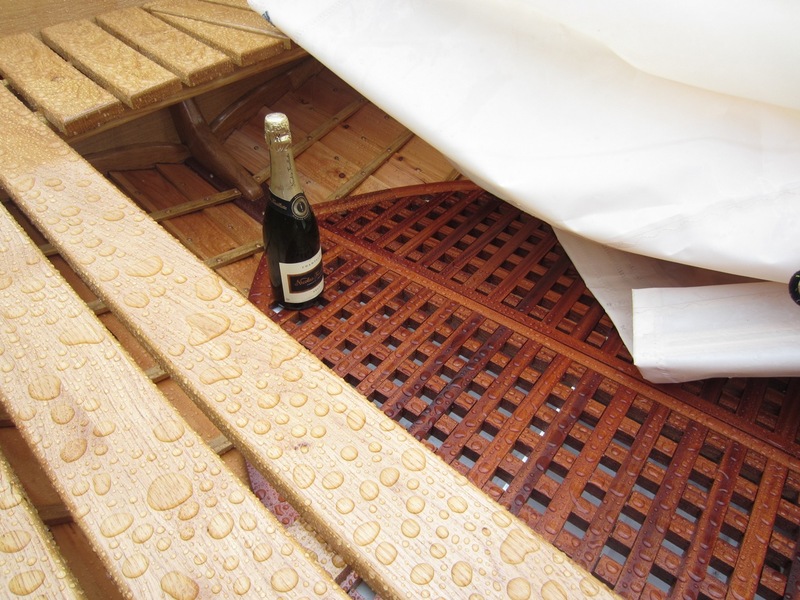 He added that it can accommodate up to four comfortably when sailing, and six when rowed. Before coming to the BBA, George, who is originally from Alderney had retired from the Army and was living in Plymouth, where he worked in a variety of roles as transport manager, carpenter and also assistant manager for Screwfix. 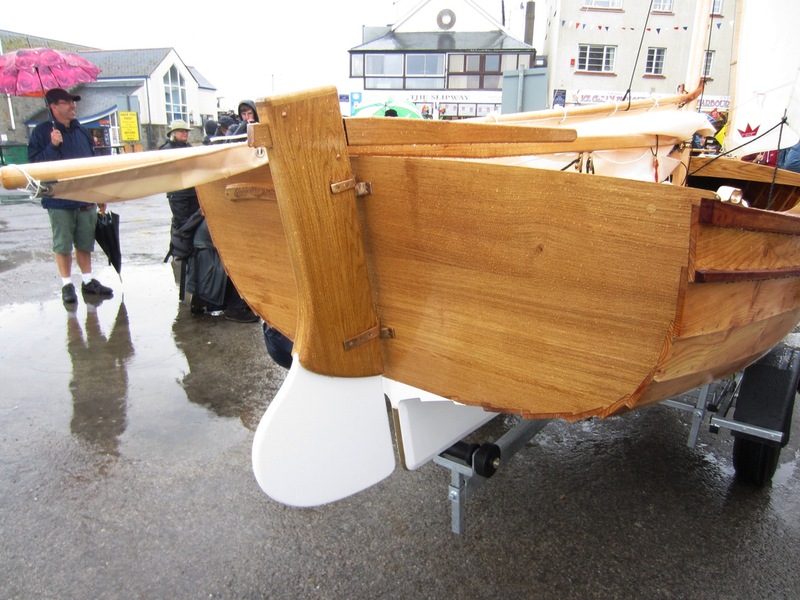 George has returned to Plymouth following his graduation from the BBA and aims to work in the boat building industry with a view to starting his own business – his aim is to specialise in traditional boat building methods. Will is originally from West Dorset but spent four years working around Australia before starting at the BBA. After graduating, Will gained a position at Spirit Yachts of Ipswich in Suffolk and is due to begin work in August. Boat Building Academy students Mike Tyler, Jon Bicknell and Andy Blundy built this strip-built South Bay-style catboat to a design worked up by the students with the help of instructor Mike Broome. Local lad Mike – he commuted to Lyme from Sidmouth each day of the course – worked in banking before coming to the BBA. However, he seems to be a man of many interests: previously he had studied sculpture at art college, where he frequently worked with driftwood, and dreamed of becoming a boat builder. Mike particularly wished to build an ‘original’ design with a sculptural form, and was inspired by the Victorian half rater built by another BBA student, Martin Nott. 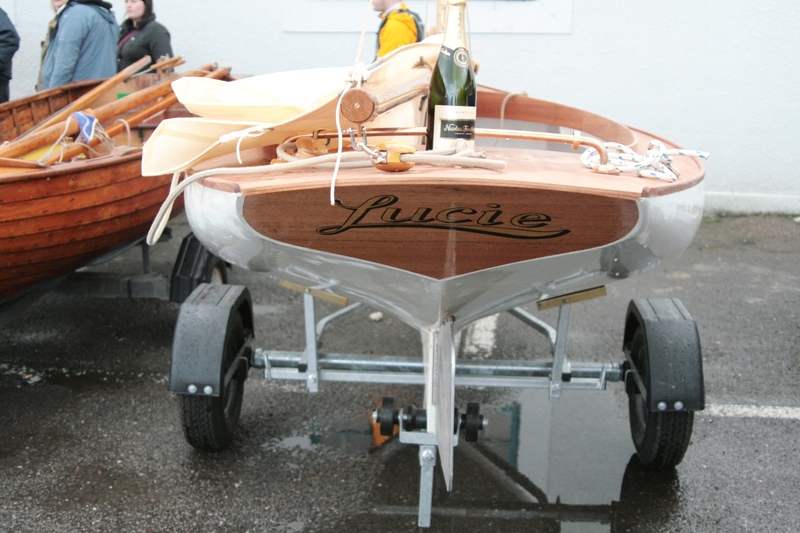 Mike then came across the 21ft Gilbert Smith design Lucile that was then redesigned to a manageable size with instructor Mike Broome’s help – and the result was the 14ft Lucie. Mike Tyler is now at Pangbourne, Reading, and involved in setting up the new Beale Park Maritime Museum. Jon comes from a background in information technology design and Jon worked predominantly with Mike on Lucie – although did spend an hour here and there on other builds. 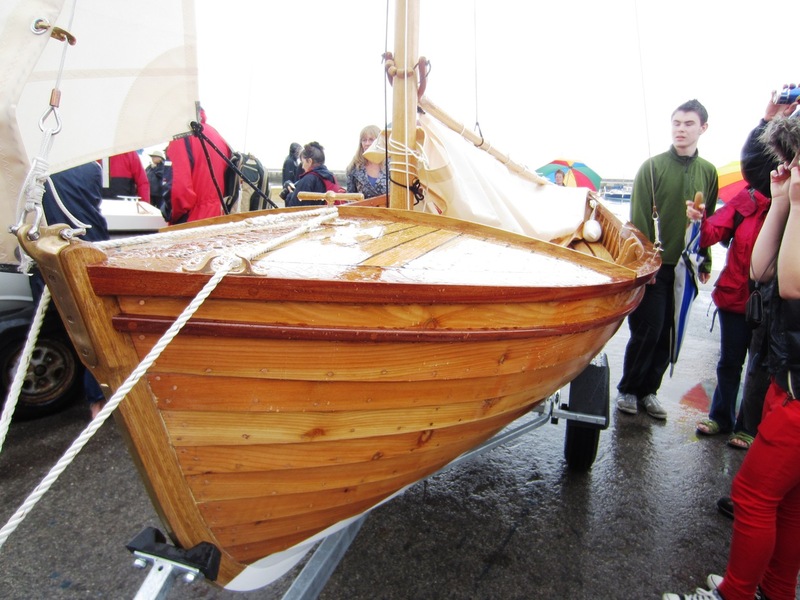 Having finished the course is now busy finding his feet in the boat building industry. I gather Andy, who was previously a floor layer, was a little less involved – but was an asset to everyone at the Academy, always cheery and ready to help. Like the other students not building their own boats, he circulated around the boat builds to gain a thorough knowledge on as many construction types as possible.